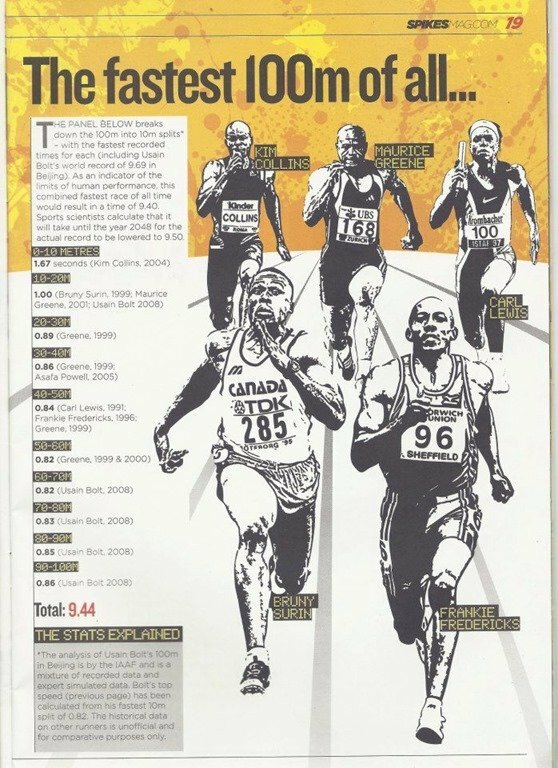 I was inspired to write this article after seeing the erroneous errors from Spikesmag’s infographic titled “The Fastest 100m of all…”. 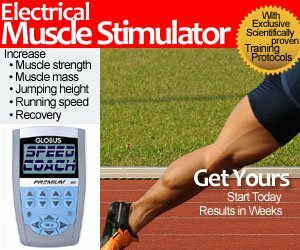 They added up the best 10 meter splits (post-Beijing 2008) and came up with a hypothetical 100 meter time of 9.44 seconds. The errors and misinterpretations are obvious, but nevertheless entertaining. (To me, sports is becoming entertainment, but I’ll save that rant for another day). 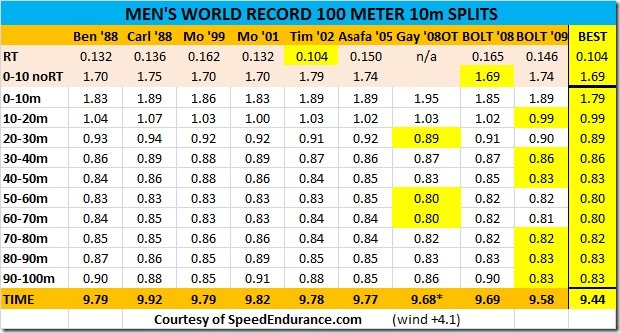 They also listed Bolt’s last 10 meters from Beijing at 0.86 seconds… and we know he slowed down. 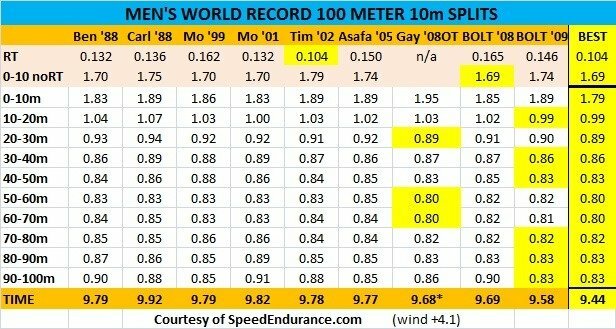 I compared the data from past world records and World Championships, and I even included Tyson Gay’s 9.68 wind aided run from the 2008 Olympic Trials. Note how I separated the reaction time from the first 10m split. If you want to remove Tyson’s times, then this fantasy run becomes 9.48 seconds. So there you have it.. the first sub 9.50 100m dash ever… on paper, in fantasyland, that is. The best reaction time was Bruny Surin. And I think It was during the semis in 1999 in Sevilla. Hi Sir, you wrote, “they have Kim Collins 0-10 meter split at 1.67 seconds from 2004. Probably true, but I think that does NOT include reaction time since most elite athletes run the first 10m between 1.83 (Ben Johnson 1988 and Maurice Green 2001) and 1.95 seconds.” Your argument is fallacious and a hasty generalization. Because your “elite” athletes did not run that time it does not preclude Kim from running. Since you appear to present yourself as some form of authority, the best way to know if he did run the time is to check. Faulty reasoning would not suffice. @Ivor, Kim Collins ran 1.67 with a RT of 0.175 (making 1.845 his 10m split) so Ben and Mo are still the fastest over the first 10m. Dennis Mitchell had a 1.80 in Tokyo with his 0.090 RT flyer. 1st Thank you Jim for putting this together for us. 2nd This is what is wrong with track and field when you have others who are ready to put others down as soon as they read something. “Since you appear to present yourself as some form of authority, the best way to know if he did run the time is to check. Faulty reasoning would not suffice.” Not the place for this, get yourself a blog and if we want to hear these comments we will follow. Anthony, you perhaps misunderstood my intent. I am not an athlete, nor am I a lover of US Track and Field. I am from the tiny island of St. Kitts, the land of birth for Kim Collins. My point is that, if information is being circulated or even if a critique is being made of previously circulated information, then the writer is beholden to defend his argument WITH facts and not conjecture. To contend that because one thing is so then the other must be so also, is faulty. That is my point. Interestingly, Jimson followed up by stating the facts. This is ok for me. NB, no need for me to get a blog. That is the problem, you disagree with my positing so you resort to cursing me. Hey I am from the Caribbean, I drink coconut water from the tree, bathe in the sea at leisure and have sun shine all year around. Who have time to create blogs? Right “mon”, irie. LOL. I live and breath athletics and have since I have been 11yrs old. I get what you are saying and I am the same in the fact that I like true facts myself. There is only a few blogs i read on athletics and this happens to be one of them. Jim is probably one of the few bloggers who actually responds in a timely manner and bc of that I read his blog daily. Competing and being around the sport for the time I have, meeting many of the stars of today I will say by far Kim Collins has the best personality of a sprinter I have ever met. This has me thinking about splits and comparing fastest times to 30 meters and 60 meters both indoors and outdoors with adjustments for wind. 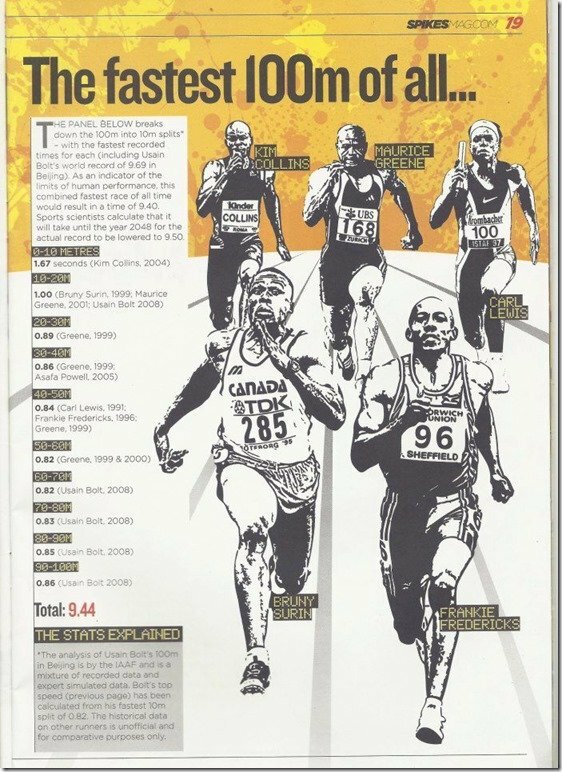 We often hear about medals not being handed out at the 30 meter mark or the difference in the distribution of energy in an indoor 60 meter race versus an outdoor 100 meter race. Do you think the numbers would support this? Where did you get the data of your table with the best 10m-Splits?